Birthplace of the Renaissance, Florence is a jewel in Italy’s crown with architectural treasures literally around every corner. The capital of Tuscany plays host to some of the world’s most beautiful museums and galleries housing works of art by da Vinci, Michelangelo, Giotto and Botticelli. The city of Lorenzo the Magnificent, Dante and Brunelleschi is truly full of magic. Florence's museums, palaces, and churches house some of the greatest artistic treasures in the world. The most popular and important sites in Florence include the Cathedral, the Baptistery, the Uffizi, the Bargello, and the Accademia. The churches of Santa Maria Novella and Santa Croce are veritable art galleries, and the library of San Lorenzo is a magnificent exhibition of Michelangelo's architectural genius. Wander some of the oldest streets in the city until you reach the Arno River, cross the Ponte Vecchio, and experience the "newest" area of Florence, the Oltrarno. Be sure to set aside time to see the vast and varied art collection housed in the Pitti Palace. When you grow weary of museums and monuments, head outdoors. Spend a day at the Boboli Gardens or climb the hill to the church of San Miniato al Monte to experience an enchanting view of Florence. 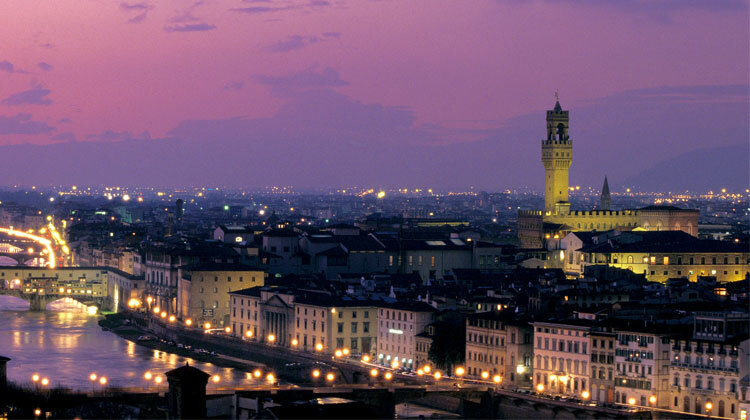 Florence is not just the cradle of Renaissance or an open-air museum. This splendid city is a famous shopping destination. In Florence you'll find all types of shops from luxury boutiques to craftsmen shops, from antique stores to food markets where you can find delicious cheese, wines and more. Florence's historical center is a mix of both historical attractions alternated with shops. The center has many stores and shops from Gucci, H&M, Furla to the Disney Store. You will also find many artisan workshops and ateliers, offering handcrafted products that have been made in Florence for centuries.